In a written reply to a question in Lok Sabha on 23rd March 2018, the Minister of State for Finance Shri Ship Pratap Shukla stated that RBI has issued instructions to all banks to provide special facilities to the disabled and elderly persons. All banks have to put in place the appropriate mechanism i.e. Dedicated Counters/ Preference to Senior Citizens, Differently abled persons, Ease of submitting Life Certificate, Cheque Book Facility, Automatic conversion of status of accounts, Additional Facilities to visually impaired customers, Ease to filing Form 15G/H and Banking at door step. 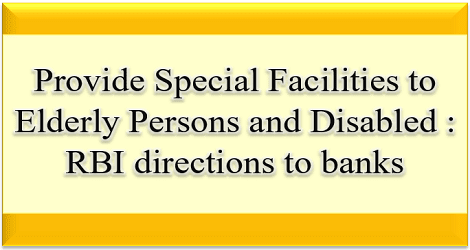 Reserve Bank of India (RBI) has issued directions on 09.11.2017 to banks to provide special facilities to the disabled and elderly persons. All banks have put in place the appropriate mechanism for following specific provisions to ease the Banking Services without difficulty to Senior Citizens and Differently Disabled Persons i.e. Dedicated Counters/ Preference to Senior Citizens, Differently abled persons, Ease of submitting Life Certificate, Cheque Book Facility, Automatic conversion of status of accounts, Additional Facilities to visually impaired customers, Ease to filing Form 15G/H and Banking at door step. Banks are taking effective steps to provide these facilities. Department of Financial Services (DFS), Ministry of Finance has advised all the banks on 22.12.2017 to implement the instructions of RBI in letter and spirit and give due publicity in their bank branches and bank’s website.